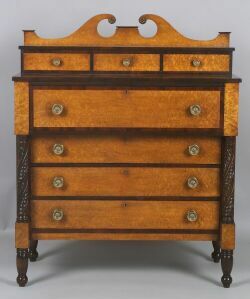 Classical Birch with Bird's-eye Maple and Mahogany Veneer Chest of Drawers, Vermont, 1820s, the scrolled backsplash above the small drawers and stepped out large drawer which overhangs three drawers flanked by leaf-carved columns above rectangular dies on turned tapering legs and feet, replaced hardware, refinished, (minor imperfections), ht. 54 1/2, wd. 44 1/4, dp. 20 in. 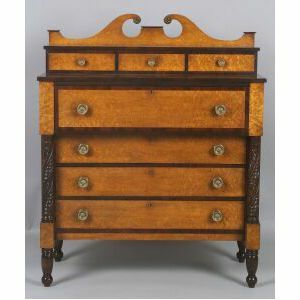 Provenance: According to oral history, in 1933, a member of the Grover family of Vermont stated that this chest was purchased from the Gilmore family of Danby, Vermont. Note: Indistinct signature can be seen beneath the stepped-out top of the chest.